Burgers have been in the news too much in the last week. And having had to pay £15 for one in a Hilton Hotel this weekend, you better believe they are not my favourite food at the moment. Photo credit: Paul Heartfield, Federation of Small Businesses. 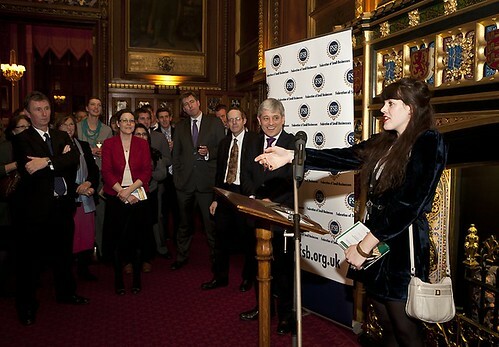 Erin Harvey, researcher to Liberal Democrat MP Gordon Birtwistle, scooped three prizes at last week’s Dods Parliamentary Researcher of the Year Awards. I am just beginning now, to find my feet in this strange place (and to find my way around). To say the first couple of weeks have been overwhelming has been an understatement! I did not think that when I was eventually successfully elected, it would be as part of a party in government. You can read Gordon’s diary in full here. Back when Cix was the main way of talking to other Lib Dems online, a tradition emerged of posting Lib Dem MPs’ maiden speeches so that people could read them and respond – a tradition LDV would like to continue. The first new Lib Dem MP to speak in the 2010 Parliament was Gordon Birtwhistle. The records reveal that Miss Ussher, the MP for Burnley, contacted the Commons fees office within 12 months of being elected, with a detailed programme of work for the property she had already lived in for five years. Move comes in the face of evidence that Treasury minister ‘flipped’ her homes to avoid paying capital gains tax. So, when interviewed by Channel 4, what did she say? Q. Is there anything you did that you feel you ought to say sorry for? The choices you made? The decisions you made? A. No. Because I haven’t done anything that anybody else in my position wouldn’t be perfectly able and valid to do. Here’s Nick Clegg on a recent visit to cheer on Burnley Lib Dems and their candidate Gordon Birtwistle, as they attempt to unseat Labour and stop the BNP. (With thanks to Hywel Morgan for the picture). What do you think they might be saying to each other, or thinking about each other? With former Government Minister Kitty Usher standing down because of her expenses’ claims, Burnley is the sort of seat the Liberal Democrats need to gain from Labour in order to do well. The Lib Dem candidate, Gordon Birtwistle, is the current leader of Burnley Council and has strong local roots and the Liberal Democrats have performed well in recent local elections. “Burnley Labour MP Kitty Ussher should stand down now and allow the people of Burnley to have their say on her replacement” says Burnley’s Liberal Democrat Council Leader and Prospective Parliamentary Candidate Councillor Gordon Birtwistle following the further twist in the story of the MP’s expenses. Councillors from the BNP, Tories and Labour parties tonight joined together to try to unseat Coun Gordon Birtwistle as leader of Burnley Council – but failed after one opposition councillor abstained.